“Vakratunda Mahakaya..” is the shloka of Lord Ganesha, by which an aspirant prays Him to give him the success in the work or task that he has undertaken, in particular; and give success in life, in general. 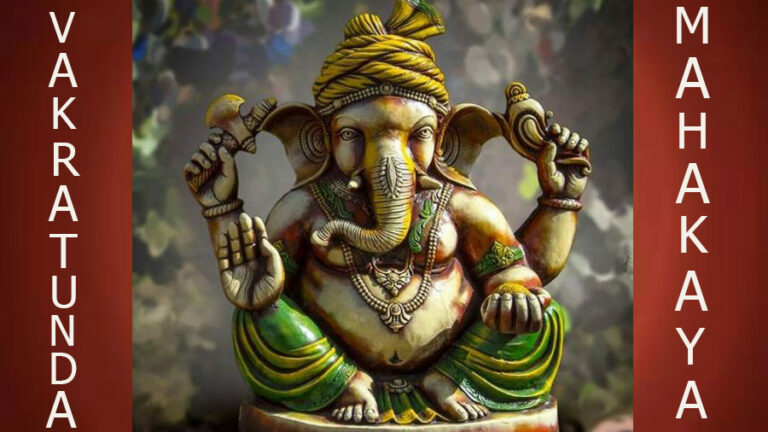 In Hindu mythology, Lord Ganesha is the first to be worshipped among all Gods. Lord Ganesha is the God of prosperity and wisdom. He removes all obstacles and bestows happiness and peace to those who worship Him. This mantra combines devotion, gratitude and the power of Sanskrit articulation to remove all obstacles of life and helps the devotee achieve wealth, wisdom and prosperity. Lord Ganesha has been known as a Remover of all Obstacles in life and is therefore also called “Vighnaharta”. The Sanskrit word ”Vighnaharta” is made from two words ”Vighna”, which translates as obstacles or hurdles, and “Harta”, which means remover. His other names “Vighneshvara” and “Vighnesha” also refers to His core function in Hinduism as the master and remover of obstacles. He is the son of Lord Shiva and Goddess Parvati and the brother of Lord Kartikeya, Goddess Lakshmi, and Saraswati. Lord Ganesha is the embodiment of three virtues namely Riddhi, Siddhi and Buddhi which means wisdom, spirituality, and prosperity respectively. He is the personification of Buddhi Himself. The other two virtues are Goddesses and considered to be the consorts of Lord Ganesha. Lord Ganesha is characterized by his mystical appearance – a human body with four hands, an elephant’s head and a rotund belly. In his four hands, Vighneshvara carries an axe (to cut devotees’ attachments), a pasha (noose, to carry devotees to the truth), a sweet dessert ball laddoo (to reward the practitioner for his spiritual activity). One of the lower hands of Lord Ganesha is shown in Abhay Mudra. In Hindu mythology, weapons are viewed as symbolic instruments to destroy the veil of ego and ignorance. Vakra – means one that is not straight. Vakratunda – means curved trunk. Mahakaya – means a large body. Suryakoti – ‘Surya’ means sun and ‘koti’ means crore. Samprabha – ‘prabha means aura or grandeur’ and ‘sama’ means like. Chanting Ganesha mantras 108 times daily invokes Lord Ganesha and His blessings are showered on the devotee. Chanting of this mantra by a devotee remove every obstacle between him and his well-being. He achieves wealth, wisdom, good luck, prosperity and success in all his endeavors. Lord Ganesha wards off all evils from the devotee’s life. He will bless the practitioner with abundance, prudence, prosperity, and success in life.